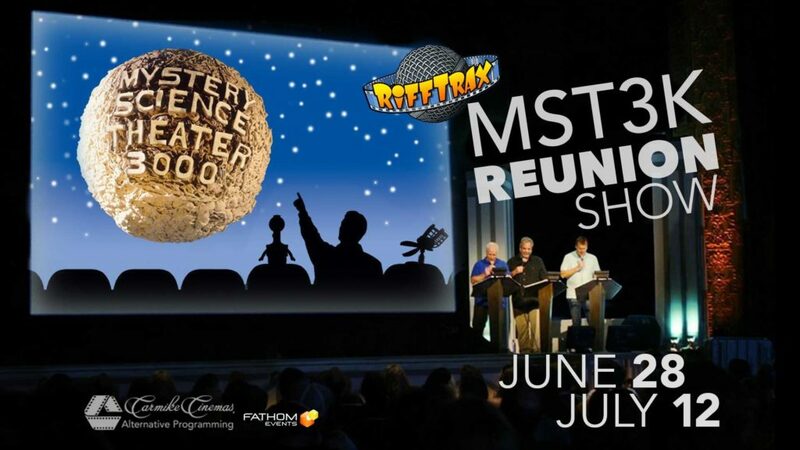 Rifftrax Live: MST3K Reunion - Movie Review - ReDVDit! 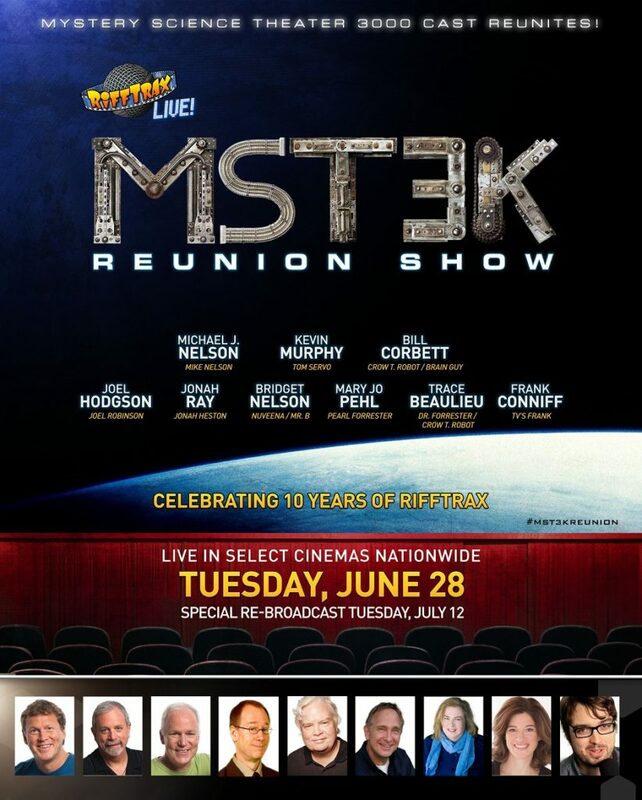 June 28th, 2016 was a very special night because it was the release of the Rifftrax Live: MST3K Reunion. Rifftrax celebrated it’s 10th Anniversary; a history of 200 movies, 250 shorts and it’s 20th live Fathom Event. However that’s not the only thing celebrated because it was also a reunion of the old Mystery Science Theater 3000 crew. We got to see Michael J Nelson, Kevin Murphy, Bill Corbett, Joel Hodgson, Bridget Nelson, Mary Jo Pehl, Trace Beaulieu, Frank Conniff and newcomer Jonah Ray riff together live on stage. Was it worth a trip down to the cinema to watch? The next set Mike, Kevin and Bill bow out and we are introduced to Bridget and Mary Jo who riffed the black and white short “Word to the Wives” which is basically an advertisement for consumerism. This short was hilarious, their jokes are very reminiscent of classic MST3K and had the audience rolling in the aisles. I think some of the best one liners come from them in this short. I’ll definitely have to check out more from the gal’s now that they are riffing together. Next up we have the Mads, with Trace and Frank coming up with another black and white short. This time it is on the subject of relationships with “More Dates for Kay“. Honestly, they stole the show. I laughed at every joke. You couldn’t help but hear Crow every time Trace spoke. Apparently Frank was told to keep it PG-13 but the innuendo was heavy and they generally had an edge that wasn’t present for the other shorts. It is an instant classic. I now have to make it a mission to see one of their live shows. We finally got a chance to see the new blood as both Joel and Jonah were invited up to do a riff on a black and white short called “Barbers and Beauticians“. It was really great to see and hear Joel again and he did a great job with his own style. Jonah you could tell was new. He had some good riffs but at times it seemed like he had so many words to say that he had to push them out as fast as possible. It’s very possible he will grow into his own role in the revamped series but he seemed quite out of his league this evening. Still, he had his funny moments, the short and riffing was good and it is obvious that Joel is mentoring him. Depending on where you sit among the Joel/Mike divide you might enjoy Jonah’s style more than I did. After this Mike, Kevin and Bill come back out to do a classic Rifftrax short “Shake Hands With Danger“. Some might want all completely new shorts to be riffed but I enjoy going back to great ones as well and this was no exception. It was really funny. You can tell the comfort the trio have with riffing next to each other for so long. It was good to see the guys on their game and was a great way to celebrate their 10 year anniversary. I forgot to mention that between each short the cast was asked about memories and what the show meant to them. Rifftrax did a “best of” clip compilation and invited their other two writers Conor Lastowka and Sean Thomason to talk a bit about working with Mike, Bill and Kevin. It was a good trip down memory lane and nice to hear from the guys in the background. It’s little touches like this that makes it so rewarding for fans. Just when you thought it was over in comes Riff-a-palooza! That is where all 9 comedians come out to the stage! “Stamp Day for Superman” with George Reeves is on tap, and man does it taste stinky. This short was pretty boring, but it is nice to see everyone getting a chance to riff. It gives the audience a brief glimpse into what the writing room looked like back at Best Brains. Everyone is taking their bows and the show is over … wait whats that? An encore? The short they will be riffing is “At Your Fingertips: Grasses” …. Yes, probably THE weirdest short ever done is now being attacked by all 9 riffers. This is the way to end a show folks. The crew went out on top with everyone in the audience laughing and having a great time. It was a strong performance and showcased each individual’s distinct voice. This was quite the experience for me. I’ve been watching Mystery Science Theater 3000 since 1991, and while that is not as long as some I basically feel like I have been raised on the show. I’m so happy that I got to watch this live event. I will never forget it. I highly recommend seeing this special reunion in the theaters. Unfortunately you missed the live show on June 28th. However, there is a special encore showing on July 12th that you might still have a chance to catch in your area. If it isn’t coming to a theater near you it is very possible they will release it in some form eventually on the Rifftrax website. I think the Rifftrax Live: MST3K Reunion is an amazingly funny experience and it is totally worth your hard earned entertainment bucks. Whiskey Tango Foxtrot: We were offered this Rifftrax Live Fathom Event for review purposes. This has not affected our judgement, rating or editorial process in any way. Please contact us if you have any questions regarding this process.